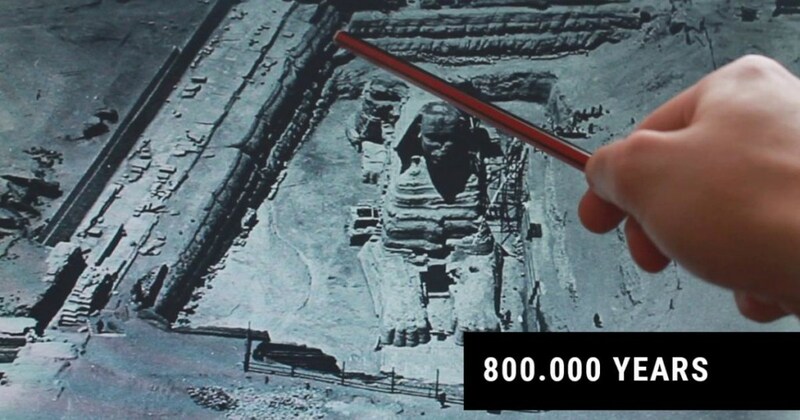 In 2015, two Russian scientists announced that the Giza sphinx was 800,000 years old. It was Robert Schoch who followed along from #John_ Anothony_West in suggesting the Sphinx was at least 7000 years old. Here I suggest it could be way older. If we think in terms of Geological timescales rather than weathering over mere thousands of years. Why not? Humans have been around for OVER ONE MILLION YEARS, so why not? “The Sphinx water erosion hypothesis contends that the main type of weathering evident on the enclosure walls of the Great Sphinx was caused by prolonged and extensive rainfall that would have predated the time of Djedefre and Khafre, the Pharaohs credited by most modern Egyptologists with building the Great Sphinx and Second Pyramid at Giza around 2500 BC. Egyptologists, geologists and others have rejected the water erosion hypothesis and the idea of an older Sphinx, offering various alternative explanations for the cause and date of the erosion…. Recent studies by German climatologists Rudolph Kuper and Stefan Kröpelin, of the University of Cologne suggest the change from a wet to a much drier climate may have come to an end around 3500 – 1500 BC, which is as much as 500 years later than currently thought. Egyptologist Mark Lehner believes this climate change may have been responsible for the severe weathering found on the Sphinx and other sites of the 4th Dynasty. After studying sediment samples in the Nile Valley, Judith Bunbury, a geologist at the University of Cambridge, concluded that climate change in the Giza region may have begun early in the Old Kingdom, with desert sands arriving in force late in the era. Schoch points out that mudbrick mastabas on the Saqqara plateau about 20 km away, indisputably dated to Dynasties I and II, have survived relatively undamaged, which he believes indicates that no heavy rainfall has occurred in the region since the Early Dynastic Period, and nor was any heavy rain anticipated by those Early Dynastic Period communities who built those structures. Reader replied to this, stating that they “were built on an area of high ground and do not lie within any natural catchment. These tombs will not, therefore, have been exposed to any significant run-off.” He concludes that “the fact that they are not significantly degraded, as Schoch has pointed out, demonstrates that rainfall itself has not been a significant agent of degradation in Egypt.” Rainfall water run-off, however, has been a more significant factor. Schoch cites evidence of flood water damage in another location to illustrate this. The Sphinx circa 1880s, by Beniamino Facchinelli. Colin Reader, a British geologist, agrees that the suggested evidence of weathering indicates prolonged water erosion. Reader found, inter alia, that the flow of rainwater causing the weathering had been stemmed by the construction of ‘Khufu’s quarries’, which lie directly “upstream” of the Sphinx enclosure, and therefore concludes that the Sphinx must predate the reign of Khufu (2589 – 2566 BC), and certainly Khafra, by several hundred years. Reader disagrees with Schoch’s palaeometeorological estimates, and instead concludes that the Sphinx dates to the Early Dynastic Period (c. 3150 – 2686 BC). To explain the disproportionate size of the head compared to the body, Reader, as does Schoch, also suggests the head of the Sphinx was originally that of a lion and recarved sometime later in the likeness of a pharaoh.